Faraon Tropical Fruit Cocktail in light syrup, with passion fruit juice, containing pineapple, papaya, guava, and sliced bananas. 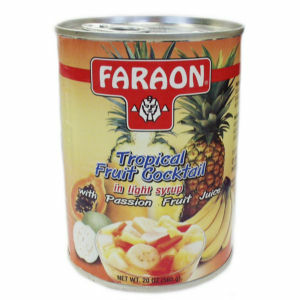 Why have the same old fruit cocktail when you can have a Faraon® Fruit Cocktail? Faraon: the fruit cocktail "with an exotic twist"! Enjoy!